Block inappropriate website content from your employees effectively without keeping your staff from the sites and services they need. With TrueHelp’s Content Filtering Solutions, you can have precise control over the sites to which your users can go. Group policies can keep certain employees from accessing sites like Facebook and YouTube, ensuring a more productive environment, and you can completely filter out sites that are distasteful for the work environment. The intelligent filtering system will automatically detect inappropriate content and block it, so you don’t need to manually enter in banned sites. Best of all, the system has a nearly non-existent footprint, unlike software filters that bog down your client workstations. If you have an old workstation that isn’t being used, ask us about configuring it as your content filter to save you the cost of new hardware! Add an extra layer of protection to your entire network infrastructure by adding a secure Firewall solution to your business. Block unauthorized access to your computers and network, protect data, and provide a strong first line of defense against viruses and malware. 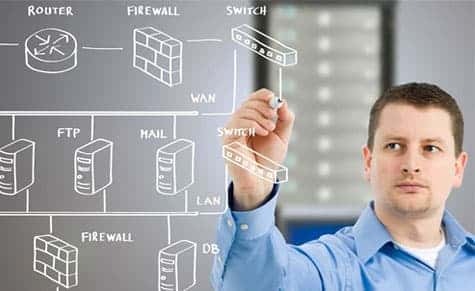 Hardware firewalls are a comprehensible security solution that requires no interaction for your end-users (unlike typical software firewalls that only offer basic protection and are often at the will of the user to decide when to allow or disallow software to run on the workstation). No sluggish workstations, no nagging access requests, and as always, peace of mind knowing your infrastructure is being protected and managed.